Veja os monumentos, ruínas e obras públicas mais importantes de Roma em uma excursão a pé de meio dia, liderada por um guia experiente. Vença as multidões com acesso prioritário ao popular Coliseu e Fórum Romano, onde você ouvirá histórias de vida e lendas do antigo império. Preste homenagem aos deuses e mitologia romanos no notável Panteão, visite a romântica Fontana di Trevi e admire obras-primas da Renascença e do Barroco na Piazza Navona. É uma introdução fantástica ao milênio de artes e história da Cidade Eterna. Esta excursão repleta de atrações e meio dia inclui acesso especial ao andar da arena do Coliseu. Excellent tour and our guide Joanna was wonderful - funny, attentive and engaging. We were taken to see the first floor of the Colosseum and then the ruins of the Forum and Palatine Hill. After that, we found out that we had got into the 2 hours tour instead of the 4 hours one, but Joanna was very helpful in locating and shifting us to the right group. We opted not to go on though! It was a really hot day and 4 hours of walking in the sun was a bit too much for us. Highlight of my visit to Rome. Wonderful guide and no lines to wait in. Amazing tour high recommended with our lovely guide, Juliano! He was fun, patient, kind and extremely knowledgeable of the colosseum. LOVED THIS TOUR! Thanks so much! We had bought a four hour tour, but turned out to be two hours, so we were a little disappointed at the start but apparently this happens sometimes. Apart from this, the tour was absolutely wonderful. Serafina, our guide, was friendly, humorous and extremely knowledgable. The chance to skip the huge lines, and get quickly inside the Colloseum was great, and Serafina's knowledge brought the building and its' history to life. The Roman Forum was incredible, and has to be seen. Very good tour. The lady-guide was very knowledgeable and extremely informative. We gained a lot from this tour. 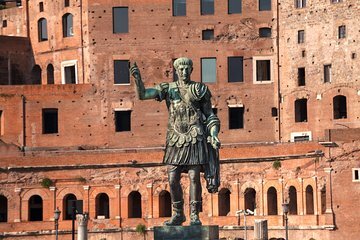 We recommend this tour to all of these people who want to feel in a mystified way the glorious Roman epoch. If two landmarks are synonymous with the eternal city they are undoubtedly the Colosseum and the Roman Forum. It's true you could visit these places on your own and deal with the ever-present queues, but why would you when you can be led by a local guide who is also an archaeologist. She gave us information and showed us things which would largely go unnoticed by DIY visitors and with her commentary ancient room came alive once more. Irene was an amazing tour guide! Not only was she a wealth of knowledge but she also was funny, concerned about our safety in the sun and heat and knew the best spots to take pictures!